Resort World Sentosa officially launched their latest attraction; K-live Sentosa – Southeast Asia’s first ever dedicated holographic theatre, on 23rd February. K-live Sentosa pays perfect homage to the best of Korean’s culture and its cutting edge digital technologies. Combining tech holographic content starring popular Korean pop stars from JYP Entertainment such as Wonder Girls, 2pm and GOT7, the Singapore edition has been enhanced through the addition of original traditional and modern dance performances for a more holistic experience. “As much as they’d love to, top K-pop acts are not able to make multiple visits to perform in Singapore within a short period of time. Likewise, fans may also not have the resources to travel to overseas performances. 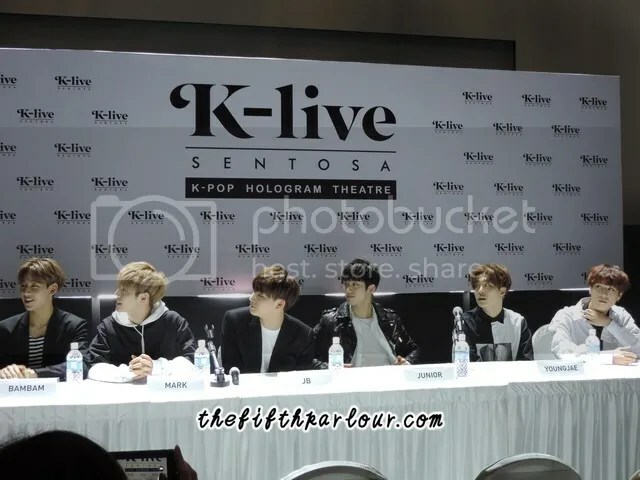 Now, with K-live Sentosa, fans can immerse themselves in a larger-than-life K-Pop experience from their favourite artistes anytime they want,”said Mr Sean Park,Director of K-live Sentosa. 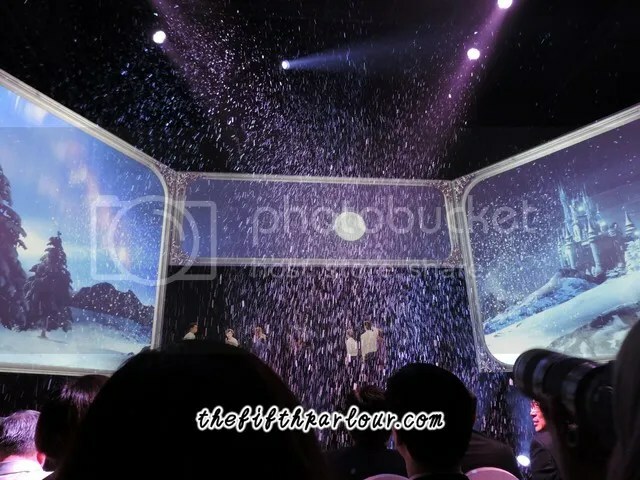 With spectacular lighting technology, 3D effects such as snow, bubble and life size puppet, it feels like you are watching a live concert upclose. The captivating experience of a high definition virtual concert makes K-live an entertaining digital attraction for visitors. To keep fans and visitors continually engaged, virtual show performances content changes every three month and the list of Kpop Stars will be updated every six months. This is to ensure that the content is fresh and updated. You can expect BLOCK B, INFINITE next on the queue for the upcoming virtual concerts at K-live Sentosa. 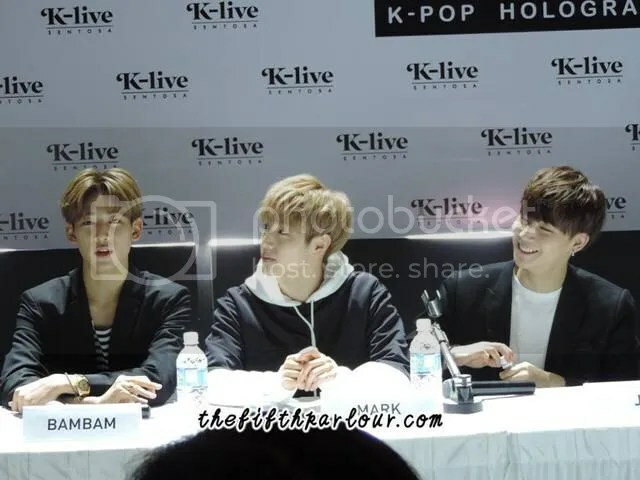 Singapore was lucky enough to have one of the group who is featured on the hologram, GOT7 at the official launch of K-live. The six out of seven members shared their experience filming the hologram concerts over the green screen. One of the difficulties they faced was pretending to have a live audience to bring out the energy. It does not feel the same for them unlike a real concert. Nevertheless, they had an amazing and exciting experience filming for K-live Sentosa. 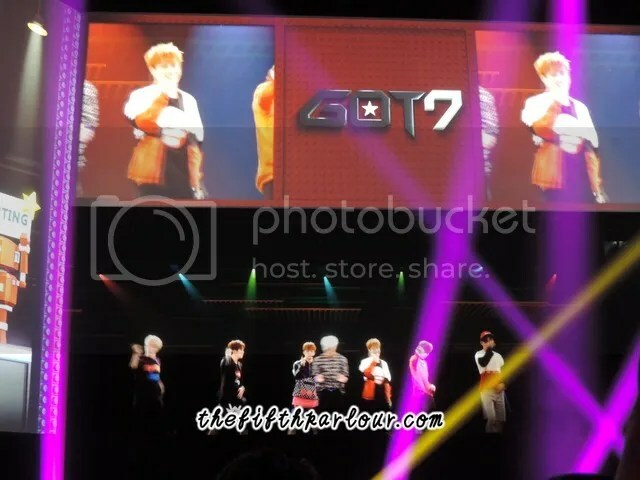 GOT7 hopes more people will get to know them as they showcase themselves to the audience via the hologram. They would also like to spend more time with their fans here not just virtually but their actual selves oon. I had the chance to experience K-live Seoul in 2014. 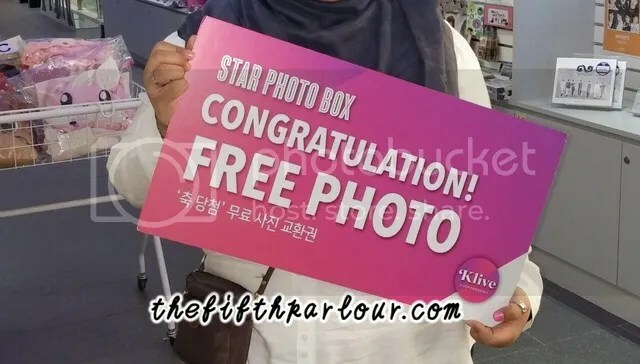 Their theatre is larger with seating capacity,selling of official merchandise,photobooth with the Kstars,unique human dancing acts before walking into the theatre,photo taking of audience before the show start and lucky audiences had their face images on the hologram screen with the Kstars.The interaction of Korean fans with the Kstars felt surreal.There was a storyline on the hologram stage with fans that makes me squeal and hyperventilate like a real concert.I was surprised to be picked by one of the Kstars at the hologram theatre and won a prize.That was a memorable experience for me. Despite the smaller size at K-live Sentosa,with full package you can enjoy Korean Modern Dance and a 5 minute behind the scenes look into the production of the holographic concert.K-live Sentosa will have updates every six months and you may expect the similarities they had in Seoul,in the future of K-live Sentosa. Nine K-live concerts slots per day awaits for you to enjoy and rock on the standing pit with 2PM, Wonder Girls and GOT7. Tickets to K-live Sentosa can be purchased at Sistic, Resort World Sentosa website or at K-live Sentosa booth. Head over to our Facebook Page to view more pictures of the official launch. The Fifth Parlour would like to thank K-live Sentosa for the invitation.